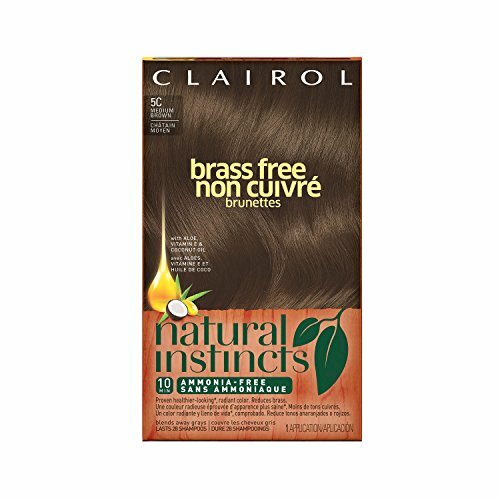 Pack of 3 Clairol Natural Instincts semi-permanent hair color kits in Brass Free Medium Brown. Ammonia free hair dye with aloe & Color Treat Conditioner fades naturally without harsh root lines so your hair will be healthy & radiant from roots to tips. Natural Instincts hair color will infuse your hair with natural looking, radiant color that conditions. This semi-permanent color fades naturally over 28 shampoos, so go for an easy brunette one month & a brilliant blond the next. Our natural, radiant hair color in ammonia-free shades with conditioner leaves your hair gorgeous from the roots to the tips. Reveal your hair's most brilliant shade with our multiple tones of hair dye colors in shades of black, brown, auburn, red & blond. All Natural Instincts hair coloring products for women & men are ammonia free, infused with antioxidants & conditioning aloe to give you long lasting, semi-permanent & natural hair color using a treatment as nice and easy as a trip to your favorite salon. If you have any questions about this product by Clairol, contact us by completing and submitting the form below. If you are looking for a specif part number, please include it with your message.